Oaks (Quercus) are majestic and beautiful. They can tower upwards of 100′ tall and drop tons of acorns in a year. When an Oak reaches about 20-30 years old, it will start producing acorns. After about 40 years, the Oak trees will “abundantly” start producing. I can attest to this because the first fall in our current home, we raked and shoveled over 4 tons of acorns and hauled them away. Imagine a truck bed filled to the top of the cab and that is what we did-twice! For a couple of weeks in the fall it would rain acorns all night- pinging off the roof of the house and the top of the cars. If you have Oak trees, then when I say -it is not safe to be outside on a windy fall day- you will know what I am saying. Acorns hurt when they hit you from the top of a 50′ Oak. 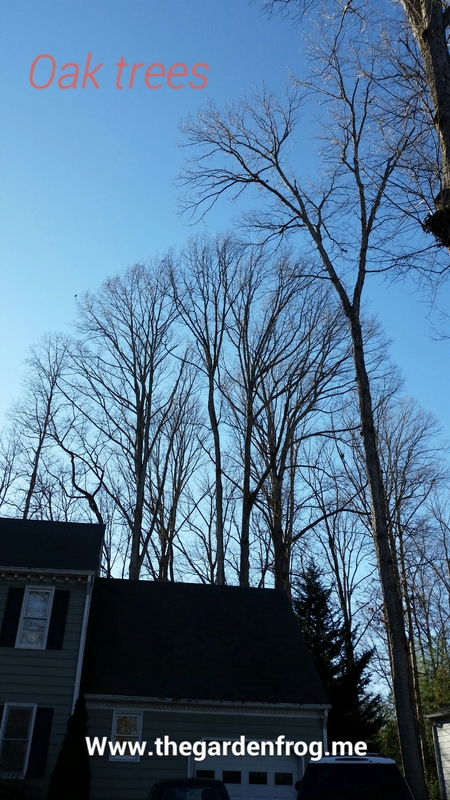 Then about 4 years ago, I hired a tree trimmer to limb (or take off all the branches) up the top canopy. He said “you are not supposed to take off more than 25%” and I replied “you are not going to kill these trees” and so I had them take off about 50%. It was the best money every spent because it cut down on acorns and it allowed a lot more sun to reach my yard and beds. I am not a pruner but Oak and other Trees need to be trimmed to keep the healthy and remove dead or dying branches. Plus limbing up large trees allows more light to reach under the trees. There are many varieties of Oaks and the most common found at garden centers (this is based on my experience) -White, Red, Pin, and Water. There are over estimated to be around 90 varieties in the United States and you can find many species of Oaks in most parts of the world. Oak trees are beautiful, strong trees that provide shade and homes to our wildlife. Oak trees are also a desirable wood for firewood, furniture, and construction use. I live in SE Virginia and there is a strong concentration of Red and White Oaks. 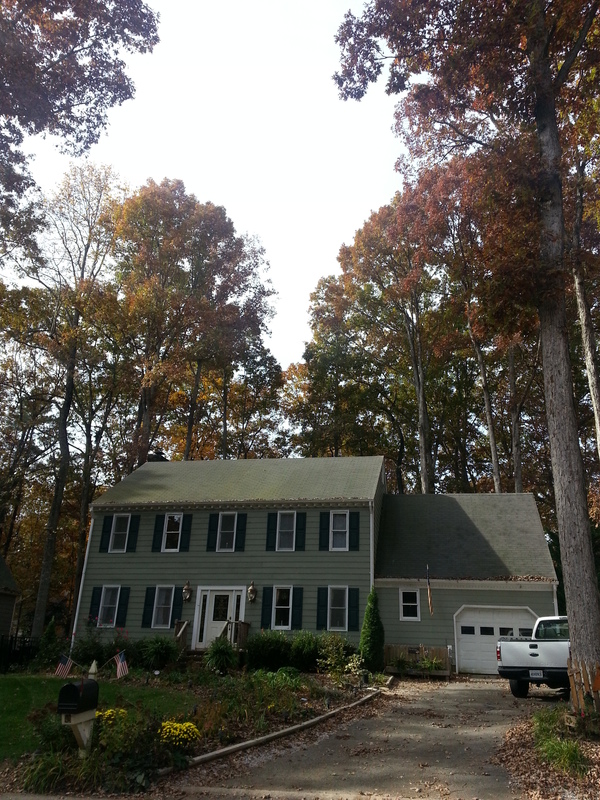 Just in my 1/4 acre subdivision lot, I have 13 mighty Oaks towering near my home and on my property line. I have had a couple removed that were in front of my home 6 years ago but HOA (homeowner’s association) would not let me remove any more. Now that I know more about Oaks, I need to push for changes in our HOA guidelines in cutting down trees. From my own experience and from what I have read in my 60 year old gardening book and online, Oak trees should NOT be planted close to the house. The Oak tree needs to have room for its far reaching branches (which means roots as well) to spread and grow without hitting the house or causing foundation issues. Our HOA rule states that any tree within 10 feet of the house can be taken down without the permission. With that being stated, an Oak tree branch can extend up to 20 feet out which means they should not be planted that close to the house. Plus, having branches hang over or next to your home can cause damage if the tree loses branches naturally or during a storm. I also want to add that squirrels can have easier access to your home through the tree tops and cause damage by chewing through the eaves and siding. I know you may think that having a tree next to the house to shade it lowers your cooling costs. That may be partially true but there is a host of other maintenance and repair issues when trees are too close to your home. If you home is well insulated and has a lighter colored roof, this can lower your heating and cooling costs. Having trees too close to your home can cause foundation issues, tree roots penetrating pipes, branches falling off on the roof and causing damage, and siding damage due to rot caused from too much moisture and mildew. From experience and the proof, the Oak tree 9 feet next to my garage has shifted and caused a 1″ gap in the concrete floor. (picture above) The gap actually is right below the branch that hovers over my garage. Another White Oak next to my driveway has cause cracks and heaves in my asphalt driveway. Oak trees need room to grow and that is an important consideration when planting an Oak (or any tree). In my area White Oaks are plentiful and it is easy to identify in the fall/winter because White Oaks have no real fall color and the leaves drop off by late fall. 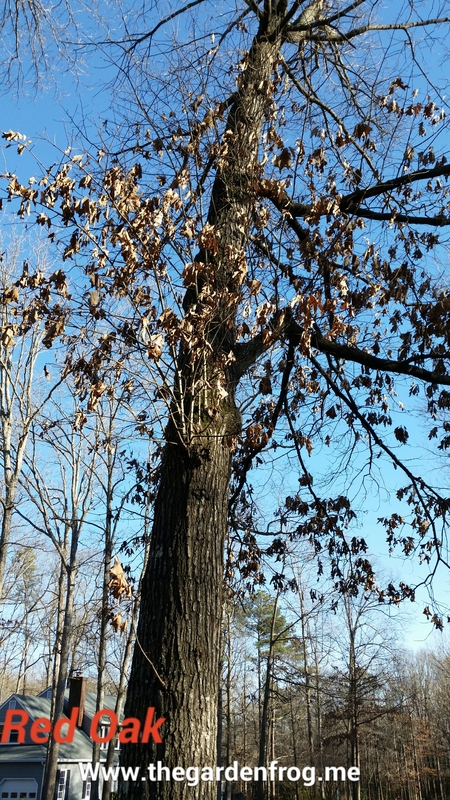 Right now in the dead of winter, the Red Oak has its brown leaves hanging on until early spring when the new leaves emerge. 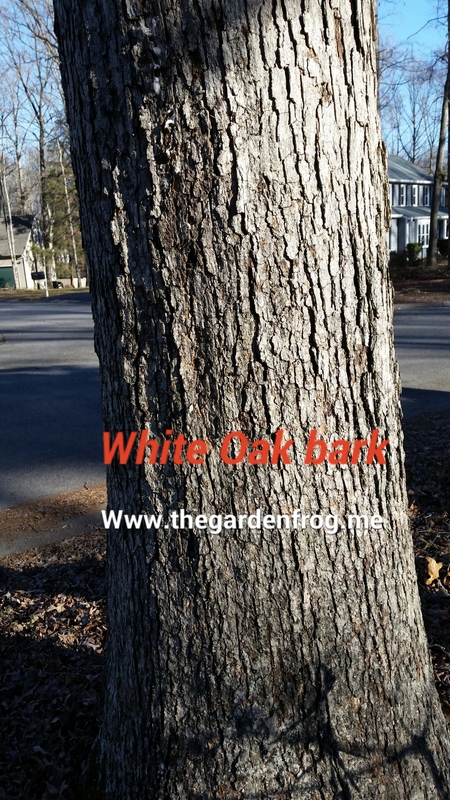 The bark on a White Oak is also different than the Red Oak which makes it easier to identify. In the pictures below you can see the difference in bark, color, and texture. Some Oaks are identifiable by their leaves such as the Water Oak whose leaves are small and do not really resemble the large lobed leaves of White and Red Oaks. Water Oaks are found in my subdivision along stream beds where they love the moisture. So my advice to you when choosing an Oak or any tree you want to plant next to any building: make sure to read the tag for the width of the tree and add 5-10′ and then divide that number in half and that is how far to plant from a structure. 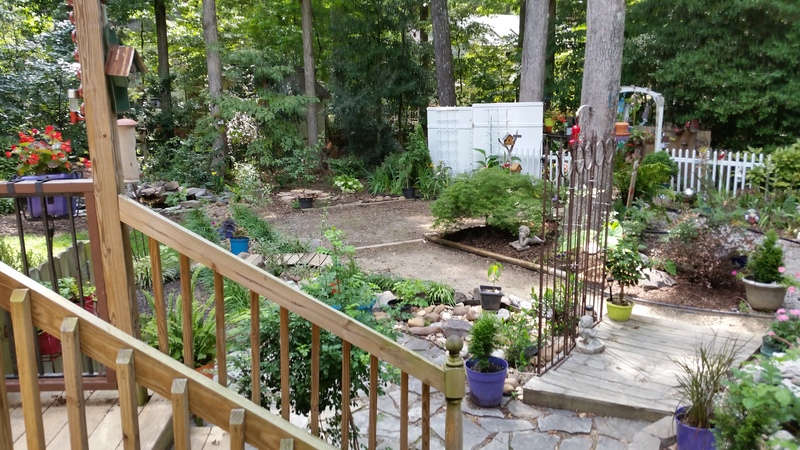 For example, if the tag reads 30 foot wide add 10 feet if you live in warmer climates that would be 40 feet and then divide by 2 which tells you to plant 20 feet away from your home or other structure. If you live in the Midwest, you could get away with 15 foot but I would not plant any closer. This gardening trick will work for any tree, shrub, or plant. It is important to know what you are planting and how far to plant a part. 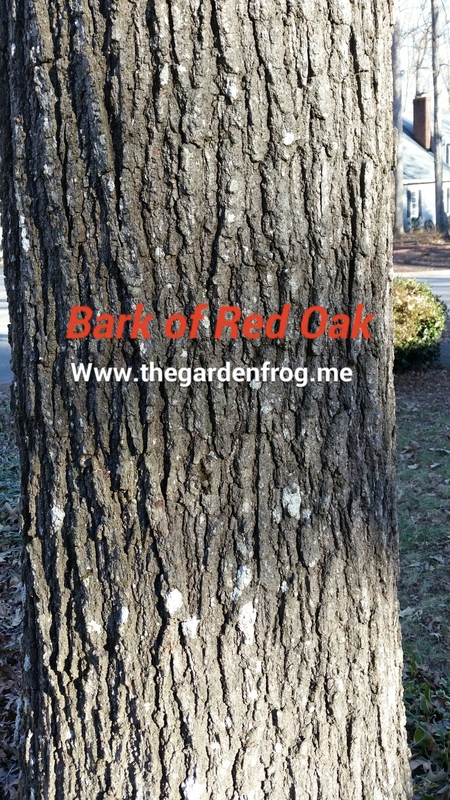 If you want a fast growing Oak, choose either a Red or Pin Oak. 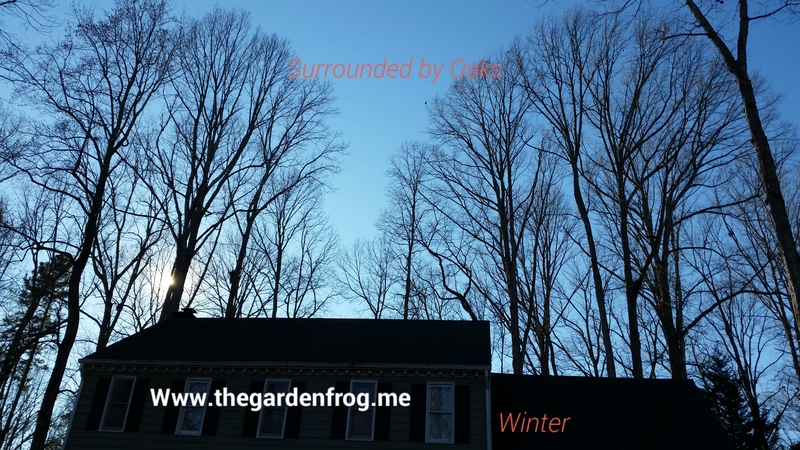 Both of these oaks are usually available at your garden centers in the spring or fall. Transplanting Oaks can be tricky and transplanting should be done in the spring before new growth starts. Keep the newly planted Oak watered every day for 30 days and make sure that you continue to water it every 3 days for another month. During the summer months you need to keep your new Oak watered at least once or twice a week if there has not been any rain. Watering is the key to success. Many gardeners and landscapers tell beginner gardeners and homeowners to plant in fall. I am not disputing this but I love planting in the spring. Spring rains in my many years of planting and gardening have helped me have beautiful gardens and great success. In my opinion, planting in the spring gives you the time to watch it grow (and maybe even bloom). I just love spring and I am always busy planting after the long boring winter. Were these trees planted near the house sometime after it was built, or were trees that were already growing on the property left during development? The latter is commendable, the former not so much! In my own (urban) neighborhood, the oaks that were planted as street trees during the original development 80+ years ago are now enormous, and completely inappropriate. These are the kind of trees that do major damage when they come down during a storm! So many people plant trees (and shrubs, and even perennials) with no consideration whatsoever for how large they may eventually grow. In the city, that often includes bradford pears and southern magnolias. One of own pet peeves (and I have many) is when people plant trees under telephone wires, and then a few years later, are dismayed when the utility companies butcher them! Some were left to grow while the house was being built which is okay for the property lines but not left to grow next to the house. Bradford pears lifespan too short. Your comments are spot on -you need to know what you are planting. My neighborhood is full of tree lovers and you guessed it, OAKS and acorns everywhere in the fall! Do you have any photos of the trees you had 50% removed? 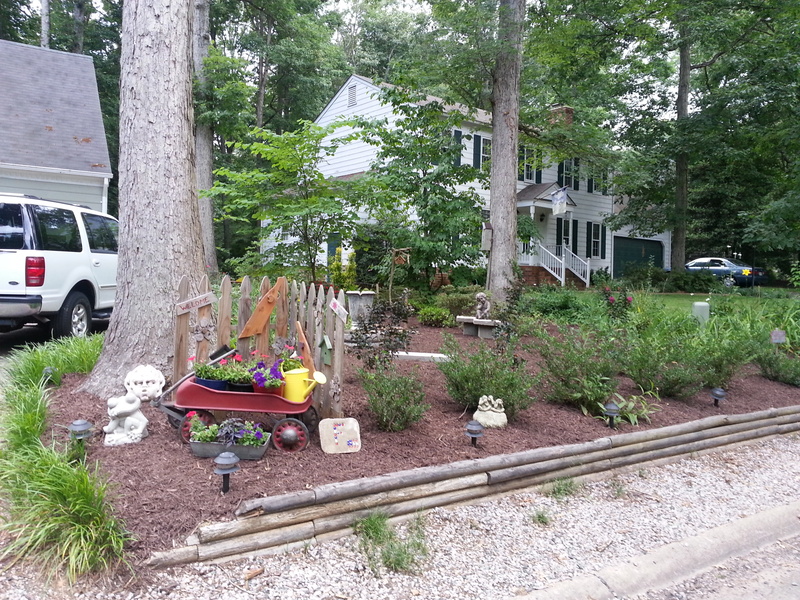 Our HOA “yard nazis” and many n’bors would have a duck is we had ours chopped down by half – but oh how I would love to! And you’re right, I would not want to be upstairs if one falls; they always cut right thru the roof, and more. I am not fond of HOAs! Please do not ask why. Did you know that some insurance companies actually request that you chop down trees that they deem too close to your house? I do think insurance companies should step in and demand that trees not be planted next to houses! it is a hazard HOAs need to step up and change the covenants. plus they need to be more environmentally friendly in some areas in the country about pesticides, invasive plants, and herbicides. thanks for stopping by!